One of the many tricky things about being freelance, is the issue of training and continued professional development (CPD). So it's great that the Institute of Professional Sound run a yearly training course that brings together a range of sound practitioners, from a range of broadcast disciplines, and puts together a two day programme with experts and manufacturers that helps sound professionals develop and continue their training. 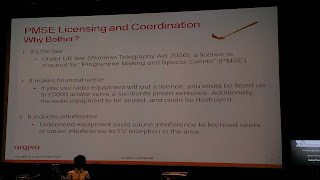 This years course has just been held at the NFTS in Beaconsfield - suitably entitled Radio Ga Ga - and has covered the trials and tribulations of Radio Microphones. The first sessions covered the terminology and theory of analogue and digital / digital hybrid radio microphones. 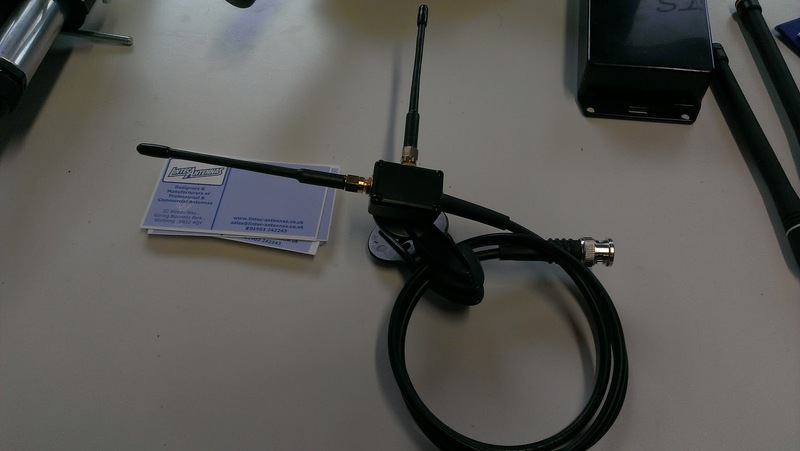 Much of the terminology translates across the analogue / digital divide, but what was interesting was to see how the digital radio mic's fit into our analogue RF spectrum, and the potential interaction between the two systems. 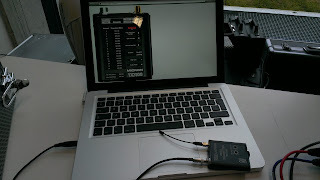 The recent Digital Switch Over (or "analogue switch off") in the UK has meant that we have far less spectrum available to us, whether we are working in the electronic handbag, on a drama trolley or a reality / LE show that requires huge numbers of radio / IEM channels; so what has become essential is that we learn how to make the most efficient use of the available spectrum and our own / hired in radio equipment. There was a wide range of manufactures and suppliers of radio mic kit present at NFTS, and it was great to be able to go and look, handle and listen to the kit that is currently available and see what is suitable for each application. There was radio mic equipment from Micron, Audio Wireless, Audio Limited, Sennheiser, Sony, Zaxcom, Shure, Lectrosonics and Wisycom. Lintec Antennas and Rycote were also there, as their products are key to the implementation of radio mic's. Microns's Mini TX with Audio Control. It was great to have such a range of kit to compare and contrast, and it was great to see in the flesh and ask the manufacturers / suppliers questions..highlights for me were the small transmitter from micron, the amazing flexibility of the Wisycom system, the build quality of the lectrosonics kit, the integration of the entire zaxcom kit (along with ability of the radios to record the audio pre transmission with timecode on a micro SD card), the un-companded sound of the Sennheiser digital mic and the T Dipole from Lintec - that's a specially designed antenna rig that clips onto the harness when working in the electric handbag. Firstly, both digital and analogue radio systems has pro's and cons, but what became clear through out the course of the weekend was that the best analogue radio mic's have now reached their performance limits, and that although there will 'always' be a place for analogue mic's, the future is looking very much towards digital systems. Secondly, the value of meeting and talking to fellow practitioners. It's so rare we get to talk to other sound professionals these days, and it's invaluable to catch up and share knowledge. The coffee breaks and meal times offered shared wisdom and experience, just as much as the main sessions did. And thirdly, if you are using radio microphone in the UK - really check whether you need a license; and if you do, bloody well get one. The recent DSO has cost the PSME a huge reduction in available RF bandwidth, and this reduction will only continue in the future - and unlicensed users are making a painful rod for their own, and everyone else's, back. With the recent consultation on WSD's , once again our radio spectrum is under threat, and if it does go ahead, the only way a device will know whether you are there is if you have a license registered on the database. The JFMG offer a great service and support to RM users in the UK, and the cost of a license is negligible - and if you've not got one, it may just cost you your shoot. A great course and weekend - when's the next one? many thanks for your kind words about JFMG; and for highlighting the licensing requirement. I thoroughly enjoyed the weekend, and it was great to network with so many wireless users. Was a pleasure to meet you - and thanks for the advice on using channel 70 for my "non-critical" comms feeds.